Autodesk.Connectivity.WebServices.dll is one of the new additions to the Vault 2011 SDK. I wrote the DLL with one goal in mind: The elimination of everything I hated about working with web services. Overall, it worked out pretty well. (Of course, if it was a crushing failure, I wouldn't bother blogging about it.) All SDK sample and apps from this blog are built on the DLL, so there are plenty of examples on how to use. Autodesk.Connectivity.WebServices.dll is an alternative mechanism for using the Web Services API. Instead of creating Web References, you just create a regular DLL reference. I encourage you to use this DLL if possible instead of the web service approach. Not only is it easier to use, but it's the future direction of the Web Services API. WSE 3.0 issues fixed. With web references, you have to go through extra steps to get WSE to work with Visual Studio 2008. Use of the DLL takes care of those steps for you. No extra steps needed. All service classes are WSE enabled. No more confusion between DocumentService and DocumentServiceWse. There is just one class, DocumentService, and it is WSE enabled. Single namespace. If you get a File object back from a DocumentService call, it's in the same namespace as a File object from the ItemService. No more need to copy an object from one namespace to another. The only exception is SecurityHeader. For technical reasons, they each need to live in separate namespaces. Single reference. 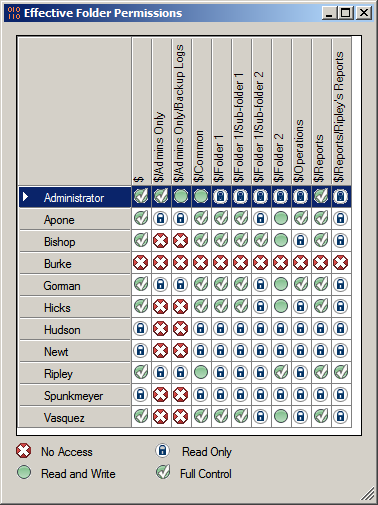 There are 17 web services in Vault 2011. That's a lot of references to deal with. True, your app will probably not use all 17, but you can expect about 3 or 4 on average. The DLL allows you to get everything with a single reference. Here is a comparison between web references and the DLL. The code is taken from the VaultList sample in the SDK. You'll notice that the two pieces of code are almost identical, and that's kind of the point. The API is the same, it's just been made easier to use. This DLL will works with all Vault 2011 products. However some of the services will only work with a specific product. So the burden is on the programmer to use only the API pieces that fit the target Vault product. 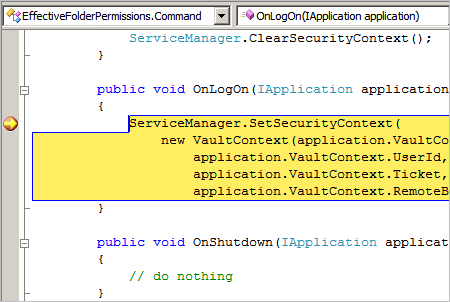 For example, if you are developing an app for Vault Workgroup, don't reference the Item Service. There are two cases where different classes have the same name. The result is a single class in the DLL with properties merged in from both cases. This shouldn't affect how your program runs, but it might be a bit confusing when you are writing code. You can't use partial classes with a class in another DLL. So if you are using the trick I documented earlier with the Invoke method, that won't work the same. The new way of doing things is to subclass the service object and overwrite the Invoke method. There is a new utility up on Labs from the team that brought you Vault. It's name is Snap and it's an indexing service for your CAD files. The goal is to have a single interface to use for searching CAD data. Currently Snap runs in AutoCAD and only indexes DWG files stored in Windows folders. Wait, doesn't Vault do the same thing? Yes... once you add the CAD files to Vault. Snap is different because it runs on your local computer. So there's no server component. No login. No setting up a working folder. All you need to do is drag in the Windows folders that you want to index, and Snap will do the rest. There are other features too, such as the ability to create snapshots and saved searches. Check it out on Labs. There you can find the download link and demo videos. Oh, and be sure to let us know what you think. Everyone who writes a custom Vault Explorer command ends up with the same development environment, more or less. So I thought I would quickly go over the setup that I use, just to have it documented somewhere. A typical development process for writing a program is 1) write code 2) build 3) debug 4) repeat. The goal of the development environment is to make those steps as painless as possible. There are a bunch of things you will want to have on your computer. Item 1 is the only hard requirement, but items 2 and 3 will make your life much easier. The Vault client. Base Vault doesn't have the ability to run custom commands. So use either Workgroup, Collaboration, or Professional depending on your requirements. The Vault SDK. If you don't have the Vault Server installed on your computer, copy the SDK over from the server machine. Note: I'm using Visual Studio 2008 Team Edition. I do not know if the Express Editions have all the capabilities that I am about to go over. OK, your computer is set up. Now you can create your Class Library project. 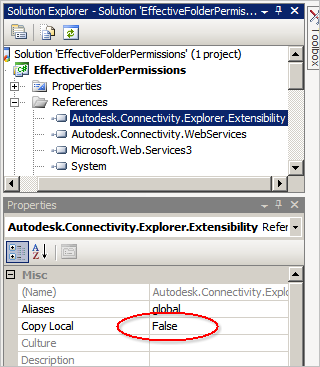 You will need to reference Autodesk.Connectivity.Explorer.Extensibility.dll from your Vault client's "Explorer" folder. This DLL is already part of the client. So tell Visual Studio not to copy the DLL to the output folder. If you are making server calls, you will probably want to reference Autodesk.Connectivity.WebServices.dll from the SDK. This DLL is not part of the client, so you want to keep the default setting of having the DLL copied to your output folder. Add a new XML file to your project and change the name to [project name].vcet.config. You can look at the SDK documentation for more information on the XML syntax. However there are some things I want to add. If you are deploying anything more than 1 DLL, you need to set AddFolderToAssemblyProbingPath to true. In fact, you can set this to true always. I don't see a reason for ever setting this to false. 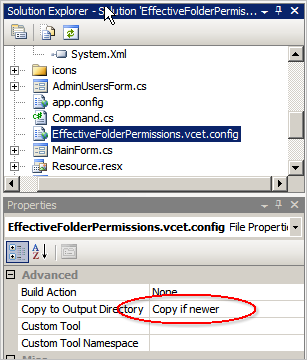 In the Visual Studio properties on the .vcet.config file, set the Copy to Output Directory setting to "copy if newer". This way, when you build, the config file goes with you. For debug mode, you can just set the build target to be the Extensions folder for your Vault Explorer client. (ex. C:\Program Files (x86)\Autodesk\Vault Professional 2011\Explorer\Extensions\HelloWorld\ ). Next go to the Debug settings and set the Start Action to "Start External Program". Supply the path to your Vault Explorer EXE (ex. 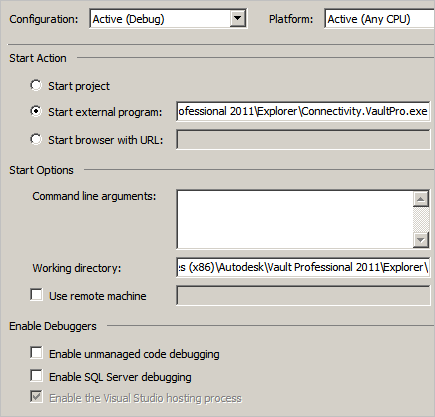 C:\Program Files (x86)\Autodesk\Vault Professional 2011\Explorer\Connectivity.VaultPro.exe ). And set the working folder to the EXE directory. You should be all set now. When you run in debug mode, it should start up Vault Explorer and halt at any breakpoints you set in your code. The Autodesk Developer Network is putting on a free webcast on the new APIs for the manufacturing products. If you missed Dev Days, this is a good chance to get caught up on Inventor and Vault. The webcast is on April 20 from 11:00 AM to 1:00 PM (EST). NOTE: The class is titled "Autodesk Inventor 2011 New APIs," but Vault will be covered too. You are writing a Vault application, and you have data that doesn't fit nicely into a Vault object. Your data is not a File Property, or a Change Order, or a Folder, and so on. Your data is something else, and you need to store it somewhere. Welcome to Storing Custom Data, which will be an ongoing series on this blog. Storing your custom data is a common problem. There are many solutions, each with their own pros and cons. In each article in the series, I will explore a different way to persist the custom data in your Vault application. In this article, I will be talking about the "Vault Options" concept. In a nutshell, a Vault Option is a name/value string pair that your program can read or write to. I like to think of it as the Vault equivalent of the Windows registry. There is a companion concept called a "System Option". The only difference is that a Vault Option is specific to a Vault and a System Option is valid across all Vaults in a given system. The maximum length for an option name is 50 characters. However the value is limited only by the HTTP max request length (50 MB is the default value for Vault). So you can get pretty creative here, as I will illustrate in an example below. Options can be set only by a user with administrative privileges. However all users can read an option. So this technique is ideal for administrative settings, but doesn't work so well for user settings. You can only get or set options data through the Web Service API. It's one of the few API features that doesn't map to a client UI command. There are 4 relevant functions and they are all in the Knowledge Vault Service: GetVaultOption, SetVaultOption, GetSystemOption and SetSystemOption. To create an option, you set it using a name that doesn't already exist. The common naming convention is to use your company name as a prefix. To delete an option, you just set the value to null. Any application can read any option value, however the application needs to know the exact option name. There is currently no way to browse options. So if your app stores data here, it's fairly safe from tampering. When you create an option, you need to remember the name. It's good form to delete an option when you are done using it, but it's usually hard to tell when this time is. As a result, several unused options may get accumulated in the Vault as time goes on, just like with the Windows registry. Effective Folder Permissions 2.0 has an example of this technique. In that application, there is a settings dialog, where the administrator can set up which folders to view in the Permissions Overview. When the admin clicks OK, the settings are serialized as XML data and stored as a Vault option. So all the settings are contained in a single option. This approach works well for this application. Not only is it easy to code, but it allows me to easily add or remove settings in the future. This example is illustrated in Settings.cs from Effective Folder Permissions 2.0. The Settings class not only stores the settings data, but it can serialize/deserialize itself to XML and save/load itself from the Vault option. Update: A Vault 2013 version of this app has been released. The problem with writing cool sample apps is that they have to be ported over to the new release. So I took the opportunity to make some improvements and show off the new API features. 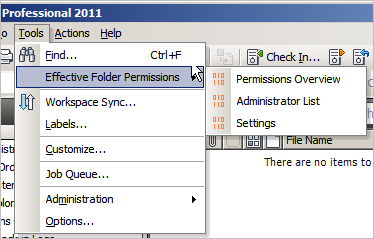 Effective Folder Permissions is a set of commands that allow you to view the folder permissions on a per-user basis. Run the install and start Vault Explorer. There will be a new sub-menu under the tools menu and a new command in the folder context menu. You must be an administrator to run any of the commands. Additional information can be found in the readme file, which is installed in the "Explorer\Extensions\EffectiveFolderPermissions" folder under your client install directory. Coming up in June is the Manufacturing DevCamp, which is a 3 day event being put on by the Autodesk Developer Network. This is a great way to boost your skill-set if you develop on Inventor, Vault, AutoCAD Mechanical, or Navisworks. It's also an opportunity to meet the experts from Autodesk and network with your peers. Introduction to Vault Programming - This class is for people who have never customized Vault before. The Vault Client and Job Processor API’s - This class will be and in-depth look at the new APIs. It's useful for people who have developed on previous Vault releases. Advanced Vault Programming - This class is for the hard-core Vault developer. It will go over advanced Vault 2011 topics, expert tips and tricks, and anything else you might want to talk about.